Congratulations Ginger Springs Day Spa in Point Richmond, California! This week’s Project of the Week is Ginger Springs Day Spa in Richmond, California. Susan, the owner of Ginger Springs, has been working with Lightning Rod Solutions Chief Consultant Kevin Pacotti since his days in the old-school print advertising game. 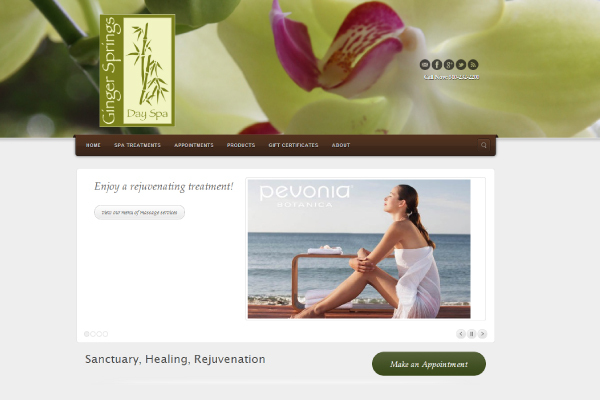 Last year Ginger Springs and LRS rebuilt the www.gingersprings.com website in the WordPress platform with a custom premium responsive theme, calendar integration, and a really inviting aesthetic, don’t you think? We encourage you to visit Ginger Springs’ website and to book a visit to their location in the eclectic, quirky, and historic Point Richmond neighborhood. ©2014 Lightning Rod Solutions, all rights reserved.